Just last evening, a graduate from the Class of 2018 emailed to recount some of the skepticism he was encountering in one of his college courses because of his Judeo-Christian values and his Catholic faith. Luckily, he’s a very bright guy and had done some rather extensive research to challenge the assertions of not only his classmates, but of his professor as well. In my response to my former student, I reminded him of the “formula” that I always recommend to all my young Christian apologists: “clarity and charity.” In fact, “charity and clarity” is a guideline that should inform all Christian apologists, be they eighteen, twenty-eight, forty-eight, sixty-eight, or seventy-eight – and even older. Strategically, it makes perfect sense. If we lose our cool, we are likely to lose the argument. If we veer from a reasoned defense of our values and of our faith and devolve into invective and name-calling, then we are likely to alienate many of the people who are listening to us. More important than the strategic value of maintaining our cool is the moral obligation to do so. Morally speaking, we can never lose respect for our opponents, even when they voice the most outlandish of opinions, even when they attack us. We must never lose sight of the fact that they are people, fellow human beings, and fellow children of God (even if they do not like to think of themselves in those terms). To treat our ideological opponents with anything less than respect would be to dishonor the God whom we seek to defend. To deal charitably with our opponents and detractors does not mean that we cannot speak and write passionately about what we believe. Indeed, if we believe in Christ and His saving message, then we should expectto be passionate. He is the driving force in our lives, the foundation of all that we are and all that we do. He is the source and summit of our existence. So, of course we are passionate about Christ and the core beliefs that derive from who He is. Passion, however, is not tantamount to anger, or mean-spiritedness, or being insensitive and insulting. Our passion for Christ impels us to be compassionate towards even our “enemies,” following Christ’s injunction to “love your enemies, and pray for those who persecute you” (Matthew 5:44). In addition to the clarity of their convictions, the Sisters of Life are the embodiment of charity. They run counseling services for unmarried pregnant women. The provide room and board and counseling services for women who opt to have their children rather than have an abortion. They run retreats and give witness talks promoting “the culture of life.” And in everything they do, they radiate joy. 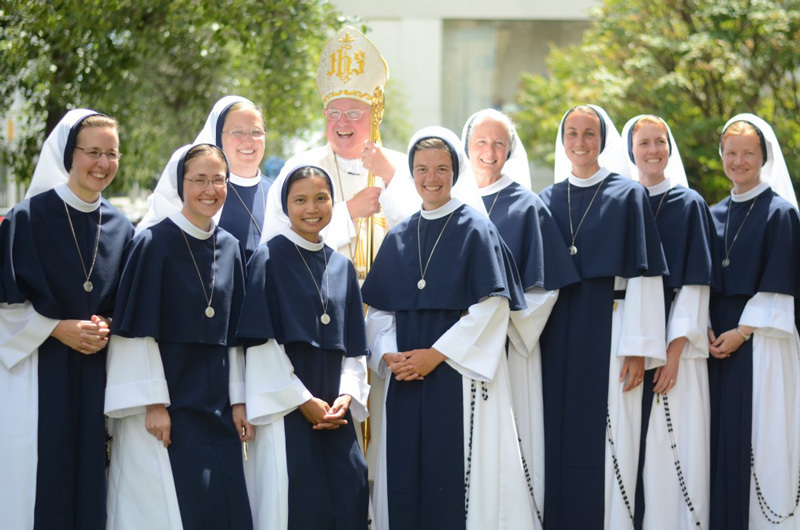 I have never visited the Sisters or helped out at one of their institutions when they have not been smiling and laughing, kind and gentle – a true reflection of the love of Christ. The Marianists have been blessed to know the Sisters of Life for over ten years now. Our own “master carpenter,” Fr. Garrett Long, has spearheaded numerous renovation and construction projects for the Sisters. Fr. Garrett; members of the Woodworking Club; several Brothers of the Marianist Community; and, in recent months, volunteers from the Alumni Association have built furniture for the sisters, put up sheetrock, painted walls, and even done some gardening. The Sisters have reciprocated by speaking at Communion breakfasts and young alumni retreats, giving conferences to our men in religious formation, and, of course, praying for us. There’s something particularly effective, I’ve always thought, about the prayers of the Sisters of Life. If anyone has God’s ear, they do. The Sisters are the real deal. They pray daily for the protection of human life, particularly unborn human life. They have helped hundreds of unwed mothers in a manner that is so kind and caring that, on more than one occasion, I have been brought to tears. They are a living expression of the message of the Gospel. They are a template of faith in action. They are unabashed in their beliefs, yet as kind and as gentle as anyone I have ever met. I couldn’t think of a better example of “clarity and charity” than the Sister of Life. As all of us wonder how we can live our faith in a world that, in many cases, is indifferent or even hostile to our beliefs, we would do well to remember the Sisters of Life. They are a model of “apologetics in action.” They embody the “clarity and charity” incumbent upon everyone who takes Christ and His Gospel seriously. They are an inspiration to all of us.